Show your love for your pet and bring them home with a Bone Large Engravable Pet I.D. Tag in Black! The Bone Large Engravable Pet I.D. Tag in Black will ship to your door, ready to use. Don't let your pet leave your house without I.D. so they know how to get back. This larger I.D. tag allows for more information to be engraved and works well for medium to large breeds or for dogs with longer hair where visibility is important. Include your pet's name, your phone number, address, medical conditions, etc., with this substantial pet I.D. tag. 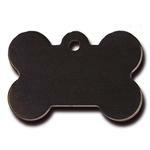 Our pet tag designer will create a look that's legible and stylish. The matte black looks great with any style collar and the silver letter engraving will stand out against the dark background. This I.D. tag will be carefully customized and hand polished for your pet. Your tag will arrive with a jump ring connector to apply to your pup's collar. Made with an enameled black coating with an aluminum base. Look for other charms or our Large Bone-Shaped Pet Tag Silencer to protect your pet's tag. Bone Large Engravable Pet I.D. Tag - Black Customer Photos - Send us your photo! Kleo is blinging in the New Year with her big bad black bone! Posted On 07/17/17 by Tara B from , MN Yes, Tara B recommends this product! I bought one of these for my dog, Dexter, a year ago. Since then, I got a second dog, Hunter, so I bought a name tag out of one of the vending machines at the pet store. Not only is it hard to read, but the metal around the holder already tore. Now Hunter has one like Dexter's, which still looks great. Basic, good quality, Big tag with lots of room to engrave. Nice size for a bigger dog for sure. Posted On 11/14/16 by Joyce J from Sarasota, FL Yes, Joyce J recommends this product! I got this for my friends dog, for xmas, I am sure they both will like it. Posted On 11/08/16 by Maggie from Norfolk, VA Yes, Maggie recommends this product! These tags are very study and the engraving doesn't wear off! Very affordable and pretty colors and styles too! Posted On 10/10/15 by NL from Dallas, TX Yes, NL recommends this product! Really cute. You get to customize it any way you'd like. Posted On 01/08/15 by Catherine P from Green Valley, CA Yes, Catherine P recommends this product! Posted On 12/08/14 by Chelsey from Henderson, CO Yes, Chelsey recommends this product! I needed to update my dogs name tag with my updated address and phone number and I came across this tag. It's perfect and the font is super cute too, the price is perfect and cheaper than buying one at the store! Posted On 09/20/14 by REECE W from Black Creek, GA Yes, REECE W recommends this product! I ordered this and couldn't believe that it shipped out the same day! I rec'd it 2 days later - Looks awesome! Very nice quality on the tag and the engraving. I couldn't be more pleased. I feel so much better knowing my dog has an I.D. tag, now. Thanks a lot!